There are eight B vitamins. Their role is to keep you body running like a well-oiled machine. These essential nutrients help convert your food into fuel, allowing you to stay energized throughout the day. After you eat, your body has the demanding task of making good use of all these energy-supplying nutrients. Thiamine plays a central role in the generation of energy from carbohydrates. This vitamin is drastically needed if you have an overactive thyroid. Riboflavin is involved in the energy production as well as the catabolism of fatty acids. The lack of Vitamin B2 suppresses thyroid function in that the thyroid and adrenal glands fail to secrete their hormones. Niacin plays an important role in energy transfer reactions in the metabolism of glucose, fat and alcohol. This is needed to keep all the body’s cells (including the endocrine glands) in efficient working order. Pantothenic acid is involved in the oxidation of fatty acids and carbohydrates, including biosynthesis of neurotransmitters. Folic acid acts as a co-enzyme and is needed for normal cell division, especially during pregnancy and infancy, which are times of rapid growth. Folate (the pure form, recommended) also aids in erythropoiesis, the production of red blood cells. Vitamin B12 is involved in the cellular metabolism of carbohydrates, proteins and lipids. It is essential in the production of blood cells in bone marrow and for nerve sheaths and proteins. People with an underactive thyroid or people with no thyroid at all cannot absorb this vitamin. A serious lack of B12 can cause mental illness, various neurological disorders, neuralgia, neuritis and bursitis. Some doctors believe the “normal range” of B12 is too low and that the normal range should be at least 500 – 1,300pg/ml (rather than 200 – 1,100). Without this vitamin, the thyroid cannot utilize its iodine raw material efficiently to make its hormones. This vitamin is needed even more by an overactive thyroid. Muscle weakness is very common in people with an overactive thyroid and in those who are also lacking in B6. Juicing fruits such as honeydew, lemons and cherries can provide you with a bountiful amount of vitamin-related benefits. Apples – are another good ingredient to try juicing. They are rich in Vitamins A, B1, B2, B6, biotin, folate and pantothenic acid. They have a very high mineral content, which is beneficial for the health of your skin, hair and fingernails. Apple skin is a source of quercetin, an antioxidant that keeps the heart and lungs healthy. Celery leaves – another great juicing ingredient, particularly used as a base due to its high water content – are a great source of vitamin A. The stems are an excellent source of vitamins B1, B2, B6 and C with rich supplies of potassium, folic acid, calcium, magnesium, iron, phosphorus, sodium and plenty essential amino acids. 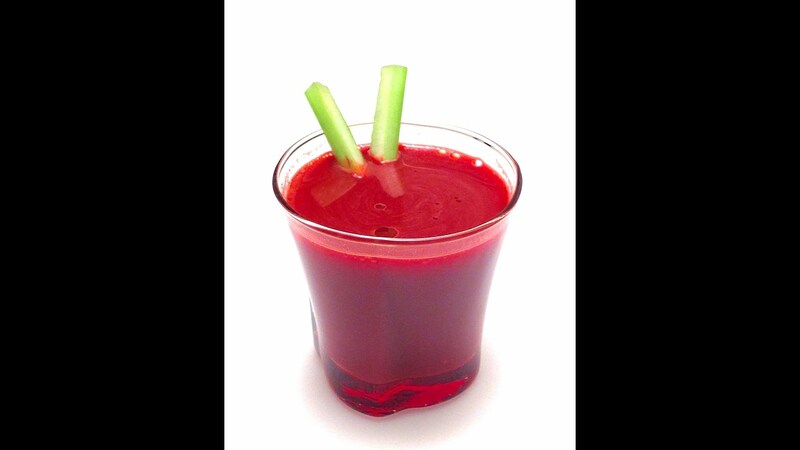 Including 4 stalks of celery in your morning Raw Juice can lower high blood pressure by 12 to 14%. The Chinese have been using celery for its blood pressure reducing action for centuries and now you know why. Place all ingredients into a juicer, process and pour into a tall glass. Enjoy!